A flawed heuristic, in which after an event an individual or group claims that they knew outcome of the event along. When they could have only known the outcome of the event in hindsight. This is most produced when the event could not possibly have been predicted. Hindsight Bias is also known as the knew-it-all-along effect or creeping determinism. The hindsight bias was first reported by the American psychologist Baruch Fischhoff in 1975. Part of Fischhoff’s discovery of hindsight bias came from a study he conducted wherein participants were questioned about the likelihood of various events, after the events happened participants were requestioned about their original predictions. 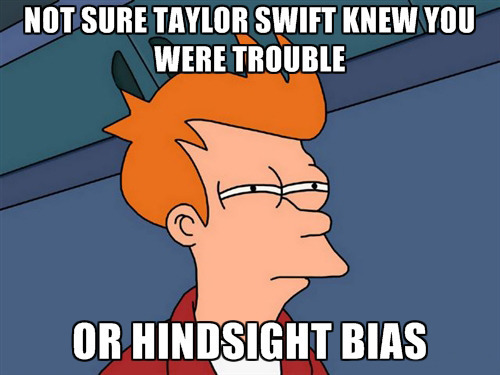 Was Taylor Swift experiencing the Hindsight Bias? Taylor Swift may have been experiencing the Hindsight Bias when see wrote the lyrics: ‘I knew you were trouble when you walked in’ and ‘I think part of me knew the second I saw him that this would happen’. Since the song is about someone she has a relationship with we can inter that she did not think this person was trouble or that see ‘knew… that this would happen’. If she did, then she wouldn’t have entered into a relationship with this person. Another example of hindsight bias is when people are wrong about the outcome of an event, but claim they knew it was going to go the opposite way to which they originally stated. To give an example of this hindsight bias: Imagine you have a coin with two sides, one is heads and one is tails. You say to your friend that you are going to flip the coin and if they can accurately guess what side the coin will land on you will buy them a pizza. They say heads. You flip the coin and it lands on tails. Then your friend says ‘I knew it. I knew it was going to land on tails’. This is a clear example of hindsight bias, your friend said heads before the coin flip and claimed they knew it was going to be tails after the event. This one of the many examples of hindsight bias that we unwittingly encounter every day. A further example of hindsight bias. You and your friend are leaving to walk into town, before you leave you ask your friend if you should take an umbrella. Your friend replies: ‘No, it’s not going to rain today’. When you are walking into town it starts raining and your friend says: ‘I knew it was going to rain today’. When earlier they claimed the opposite. Given the hindsight of the situation i.e. knowing that it is raining, the person has falsely claimed to know that this was going to happen. We know that if they really did know that this would happen then they would have told you to take your umbrella. A final hindsight bias example is perhaps the most interesting. This is the hindsight bias of the people who trade on the stock market. In the stock market, there are two main options you have. Trading long, or trading short. Trading long is buying a stock in the hopes that the stock will go up in price, so that you can sell it at a profit. Trading short is borrowing a stock, selling it straight away, and then hoping the price goes down, so you can buy the stock back to return to the person who you borrowed it from, while keeping the difference it sale and buy prices. In either case, if a person has bought a stock and the stock as moved in a way contrary to the manner in which they expected, then that person will often exclaim in an angry manner that they knew that this was always going to happen and that it is the hindsight bias. This is a video of a poker game. At the end of the video the player Zeidman gets the single card he needed to win. If he did not get that card then he would have lost. During the video the player Harman has a 98% of winning. So Zeidman had a 2% chance of getting that card – yet when Zeidman shows his hand and wins Harman claims: ‘I knew you had that’, despite placing a $3000 bet beforehand. This is a real life example of the hindsight bias.